Hi everyone!! Well, our son's wedding went off without a hitch, we partied like rock stars, but now I am back to work and taking all of your CHA Summer 2012 orders. Anything you see that you may want, there's a good chance that I have already pre-ordered for you, or am in the process of ordering. Please keep in mind that my prices will always average at least 25 to 30% (or more!) below the Retail/MSRP price. To place an order with me, or to just make an inquiry about products, all you have to do is email me at gcporders@yahoo.com and put the word "ORDER" in your email subject line, then list the items you are interested in, along with the name of the manufacturer, the product name & if by chance you have it, the product code. To see which products have already been, or are just now being released, here's a great site: http://www.scrapbookupdate.com/cha-summer-2012-sneak-peeks/ . BTW, you will likely see many of the manufacturers listed there more than once, but that's because each time they're listed, that manufacturer will have released products on each day they're listed, since many manufacturers spread out their new releases over a week or more!!! So take a look, enjoy and then send me your email with your list!!! It feels great to be back to work and I look forward to helping all of you with your Summer CHA 2012 orders. Thanks in advance soooo much for your business!!! Great news!! We finally have a New Puppy!! I finally have a new puppy, thanks to a surprise visit from my only sibling, sister Gail. She gave me that extra push I needed to find the right one, and then she made all the arrangements for me to get the puppy. 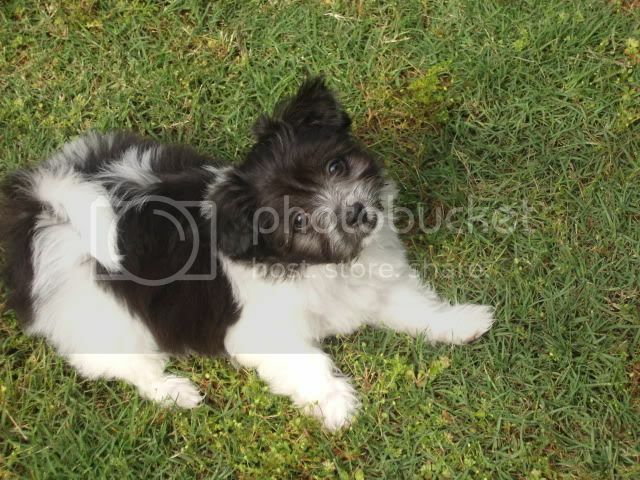 She is a "Shihchon", which is half Bichon Frise and half Shihtzu. They're called the Teddy Bear dog because they look like a little stuffed animal Teddy Bear!! She weighs 3 pounds! She's sooo cute it's ridiculous, she's unbelievably smart and she's a serious lover and snuggle bunny. Oh, and she hops like a bunny--it's hilarious!! She's non-allergenic, so she can be around anyone who normally has allergies to dogs!! She has no name yet because we're waiting for my husband, Moe to name her, because he has named all of our dogs!! I am totally in love with her and she is already healing my broken heart from when I lost my last dog, Gucci. Most of you know I have been living with a seriously broken heart since last July 6, 2011 when we very unexpectedly lost our darling Brussels Griffon named Gucci, who was my 24/7 companion. And for a long time, I couldn't even think about "replacing" her. But when I was finally ready to start looking, it seemed like every time I thought I had found the one I wanted, something would go wrong and the deal would fall through. Even last Friday, I spent 4 hours at a huge Pet Expo/Pet Adoption Event where every rescue group from southern CA had all their adoptable dogs. I looked at hundreds of dogs & finally found one I was very interested in, spent about 30 minutes with her, started to fall in love & then the main person of the rescue group she belonged to came back from lunch & informed myself & the volunteer who was helping me that she had already been adopted 20 minutes before I got there!!! Yikes!! So this is the kind of thing that kept happening to me & honestly, I was beginning to wonder if I would EVER find the right dog for me. But when one of these doggie deals wouldn't work out over the past couple months, some very wise friends of mine kept telling me it was OK because whatever dog I just missed out on was NOT supposed to be my dog and I would find the right one when the time was right. Well, they were sooooo right!!! It's been about eleven years since we had a tiny puppy in this house and you sort of forget that it really is like having a little baby in the house, LOL!!! Let's just say that I've had even less sleep than usual, which isn't a good thing, but I know it won't be like this forever! But she is sooo worth it!!!! So if you email or call me and if I don't get back to you immediately, it will be because I'm probably trapped with a sleeping puppy curled up on my chest, with her little face snuggled up against mine, with the scent of her little puppy breath wafting across me--(way better than any designer perfume IMHO!)!! My philosophy is to never bother a sleeping puppy!! Just give me a couple days for us to get situated and get her acclimated to life here in our home!! Oh who am I kidding--just give me a couple days to just snuggle her and love her, LOL!! TIA!!! Who LOVES Tim Holtz’s Products and are You Attending Tim Holtz’s Very First Online Class? See the Tim Holtz Interactive Catalog Below for EASY Supply Ordering for ALL of Tim’s Products!! It is an online class which incorporates the very best formats available for online classes in that they are interactive classes because you can ask questions and interact with the instructor and other class participants in the Class Forum, but you can actually “attend” the classes and watch the videos on your own schedule, and the very best thing is that you have LIFETIME access to all the class materials, videos, PDFs, etc.!! For anyone who still wants/needs to order supplies for the class, or for anything else pertaining to Tim Holtz’s products, I’m posting a link here that is an actual 84 page INTERACTIVE PRODUCT CATALOG of Tim’s products that you can page through online, which will make it easier going forward for all of my customer's to make up your lists of products that you want to order and then just email it to me at gcporders@yahoo.com . (Please put the word “ORDER” in your email’s subject line!!) But what I need to be sure that you understand is that this catalog shows all the products with their MSRP prices (which means “Manufacturer’s Suggested Retail Prices”), and unfortunately, I’m not able to edit those, so I want to remind all of you that my prices are always an average of at LEAST 25% or more off of the MSRP!!! You never need a Coupon Code, you never have to wait for a sale, and you never have to jump through hoops to get my discounted prices—they are that way 24/7, 365 days a year!! So when you’re making your lists to email to me, just total it up using the MSRPs that you’ll see in the interactive catalog, then deduct 25% to get your average total with me!! For those of who are taking Tim Holtz’s online class, Creative Chemistry 101, there’s a Class supply list provided on their site, but I thought I’d make it easy for you by also posting it here. Please let me know if I can help you with any of these!! So if you ever wished that you understood when to use dye ink versus pigment ink, or what type of inks or other colorants work best on dark papers versus light papers and many, many other things that will help you to better utilize the supplies you already own, or to help you intelligently buy the supplies you need for your projects going forward, then go on over to the Creative Chemistry 101 site, read through the class descriptions and get yourself registered. This is not just a class that will teach you about Tim’s products, but it will also educate you about the same type of products from any manufacturer, which might well help you save a heap of money in the future!! Ever Wondered about Digital Scrapbooking or Card-Making? If you’re in Southern California, you’re in LUCK!! Ever edited a photo? Then you’re already a Digi Scrapper! Learn how to do Basic Photo Editing or to use digital techniques on your cards!! Whenever I mention Digital Scrapbooking or Card-Making, inevitably several paper crafters very adamantly express that they will NEVER do digital!! But I think what many of them don’t understand is that they have ever edited a photo before they scrapped it, they have already become a digi scrapper/card-maker!! If you’ve ever wished you could use your computer to realistically, quickly and easily correct and enhance your photos, fix your mistakes, etc., then you absolutely need to take advantage of one of the last chances any of us will have to take classes in person from THE DIGITAL SCRAPBOOK TEACHER, Patty D. at Scrapbook Expo here in Orange County, CA before she retires her traveling classes. She is teaching classes at Scrapbook Expo, which is now located at the Anaheim Convention Center (the same location as CHA was!!) Fri. Feb 23rd & Sat. Feb. 24th. CLICK HERE to see the workshop schedules (they’re on the right side—see both the Friday and Saturday workshops—she has no classes scheduled Sunday!). She has seven classes scheduled for Basic Photo Editing and for Digital Card-Making. Online registration is now closed, but you can register at the show and as of now, she does have some open spots in her classes. I HIGHLY RECOMMEND any and all of Patty’s classes!! I’m sure many of you are familiar with Patty because she has been featured in many prominent craft magazines and you may also recognize her darling “Digi-Chick” avatar from her many national advertisements!! There are many degrees of digital paper crafting—there are the folks who have gone 100% digital, then there are those referenced above who are engaged in the most basic level of digital by editing their photos on their computer, then the largest group is those of us smack dab in the middle, doing what is called “Hybrid”. I am in that group and I am there because while I enjoy the many facets of digital scrapbooking / paper-crafting that allow me to get pages done more quickly, I am not now, nor do I think I will ever be ready to give up all the tactile parts of paper-crafting. I love to touch (and sometimes even sniff, LOL!!) the beautiful papers I have, I love glue dots and “real” matching embellishments such as Prima flowers, all sorts of bling, such as rhinestones, Stickles, glitter, Perfect Pearls Mists, and so on. I love brads and eyelets, and heaven knows, I LOVE ribbon!!!! And this means that I am a hybrid scrapbooker / card-maker and proud of it!! But because my crafting philosophy has always been that crafting should be easy and quick and should NEVER cause you any stress, I do love to use certain things within the digital realm to help me perform some tasks quickly and easily—“EASY PEASY” is my motto!! And the very first and most important thing I use digital techniques for is to easily edit my photos. The days of trying to fix “red eye” on photos with a special pen are long gone for me, because with a couple clicks of a mouse, I can fix that red eye in no time flat, and get completely realistic results!! And what about those photos where the subject is so dark you can barely see who it is? Guess what—again, with a couple clicks of a mouse, you can correct that as well and end up with a correctly edited photo that looks simply amazing!! I HIGHLY recommend Patty’s classes because she’s the ONLY person who I’ve ever encountered who teaches classes strictly from the paper-crafter’s point of view! I have a history with THE DIGITAL SCRAPBOOK TEACHER, Patty in that we met while we were both taking Photoshop Elements classes together at the Huntington Beach Adult School—that’s where we both began our journey into digital. And during all those classes, over a couple years time, whenever several of us were on break together we would always lament that there were no books or classes geared directly to paper-crafters. There were tons of Photo Elements books out there, but they were all written from the point of a graphics person. For a couple years we took these classes in Huntington Beach, and for a couple years we complained and complained about the fact that we had no good reference material to help us figure something out when we ran into trouble when scrapping in the middle of the night!! Which led Patty to do something incredibly brave--she decided to write just such a book. She did, and it was received with overwhelming success, which led her to teaching classes all over the country, as well as overseas. She started her “DIGI BOOT CAMPS”, and her “DIGI DEGREE” program and has been running at an unbelievable pace since her first book was released. After a huge outpouring of requests for an updated version of the book, she did a full re-write and released it this past year. To say she’s been going non-stop for years now, doesn’t even really describe her schedule. But due to personal reasons, she has decided to cut back on the traveling and do her “FAREWELL TOUR”. Which is why if you ever wanted to take any of Patty’s classes, this is now the time you must do so, before she retires her traveling teaching!! So if you’re anywhere in Southern California, I strongly encourage you to go to the Scrapbook Expo at the Anaheim Convention Center either this Fri., Feb 24th or Sat., Feb 25th and register for any classes being taught by THE DIGITAL SCRAPBOOK TEACHER when you arrive there!! First let me apologize to anyone who has been waiting for a return email from me from either yesterday (Valentine’s Day) or today. I actually took these 2 days off, but for some reason, my “Vacation Response” isn’t working in my Yahoo mail, so if you emailed me, you didn’t get an automated return alerting you that I’m actually off work—sorry!! If I don’t get to you later today or tonight, I will certainly get in touch with you tomorrow (Thursday). Next, I want to let everyone know that I’ve now added direct ordering for the new Tim Holtz Distress Markers for customers within the USA only. You can now order them directly by using the PayPal ADD TO CART button located on my MARKERS webpage in the Tim Holtz Distress Markers section, which is located about 1/3 of the way down the page!! For those of you who have already placed a pre-order with me for this full 37-piece set of Distress Markers and who have NOT yet received an invoice from me can go ahead and use the ADD TO CART PayPal button, rather than waiting for me to send an invoice!! For ALL items with ADD TO CART PayPal buttons, please rest assured that any pre-orders and all the subsequent orders will be filled in the exact same order in which they were FIRST received by me—meaning that, if for example you emailed me to place your order 2 weeks ago and you still haven’t received an invoice from me yet, you will still keep your EXACT place in line from 2 weeks ago when you use the ADD TO CART buttons. I keep all emailed pre-orders in a special folder, they are arranged in that folder by the date received, that is how I have ALWAYS filled my orders and that is how I will continue to fill them. Once all those initial emailed pre-orders are filled, then I process subsequent orders by the time frame they are done in PayPal by using the ADD TO CART Buttons, or by the time-stamp that their emails come into me for those customers who either can’t use the ADD TO CART buttons because they are International, or for customers who are placing/combining orders for multiple products. International customers can NOT use the ADD TO CART buttons!!! Please don’t try, because if you do, it will not bill ANY shipping, so then I will have to send you a separate invoice just for shipping, which means you’ll end up with 2 separate transactions in PayPal—which makes no sense!! The email address that your PayPal account is linked to. Your shipping address, including City, State / Province, Country and your postal code. A Contact phone # to reach you for questions: Please include your Contact # including any special area codes and please also include your International Dialing Country Code, just in the remote case I might need to call you for a quick question!! I am also available to video chat with both International and U.S.A. customers for order help, or other questions. Please see my CONTACT ME page for details on how to reach me through my video chat service!! Please know that whether you place any of your your orders now or in the future with me using the ADD TO CART PayPal Buttons or if you email your orders to me, I will ALWAYS make sure you ONLY pay the amount for shipping that I end up paying for your shipping label(s). For every order I receive, whether it comes through PayPal from the ADD TO CART Buttons, or it comes directly to me in an email request, whenever I get ready to pack each order, I fuss around with the package, weighing and checking different methods of shipping until I find the best way and the best price to ship that package. And if for some reason the shipping program within PayPal (through the ADD TO CART buttons) billed you an amount for shipping that ends up to be more than what I pay for your shipping label(s) when I send out your order(s), I always automatically go into PayPal and immediately refund the difference between the amount that was billed through PayPal and the amount that I end up paying for your shipping label. Those type of refunds show up immediately in a customer’s PayPal account. So my customers will never end up being over-billed for shipping with me. In fact, because I am always willing do extra things to help reduce the weight of the shipment, such as removing outer plastic clamshell packaging, etc., many customers end up saving a good deal of money when shipping with me. As always, for any questions, see all the options on how to reach me on my Contact me webpage!! I wanted to let everyone know that I’ve now added a separate “page” under my Navigational Buttons at the top of my site with PayPal Shopping Cart options for U.S.A. customers to directly order the different sets of Markers from multiple manufacturers. First, I’ve already added all the options for the Spectrum Noir Markers, including a fabulous, limited time bundle that will get you everything you need to get started and more. I will also be adding the new Tim Holtz / Ranger Distress Markers very soon. Then, as other markers or pens show up that I’m getting a lot of requests for from my customers, I will add those there as well. This blog post will be about new and exciting markers that were shown at CHA Winter 2012. First, let’s just concede the fact that Tim Holtz is a genius and once again, he’s done something phenomenal with these new Distress Markers from Ranger. And like all Ranger products, I am of course ordering these for my customers and like everything I get for you, my prices are great! The Retail/MSRP is $114.99 for the full set of Distress Markers, but my price is only $86.25! To place an order, please email me at gcporders@yahoo.com and PLEASE put the word: “ORDER ” in your email subject line!! There are 37 colors being released, which match up to the 36 current colors of Distress Inks, plus the white Picket Fence color. They do come individually, but I think most of us are grabbing them in the full set of 37 (and the price is much better when you order the full set!!). What I was really impressed with for these markers, was the ability to not only stamp with them, but the fact that they react with water in the same way that the Distress Inks do, so even when you spritz your stamped image with water, or take a water brush to it, the color stays true—it does not “muddy up” and bleed all over. You can still see the image, but you can blend or create water color effects, etc. and the colors stay true. It is pretty amazing and kind of hard to describe in words. It’s really one of those things that you’re better off to either see in person, or to watch a video. But because I’m having issues being able to download all my own CHA videos that I filmed over 4 days off my video camera onto my laptop (grrrrr!! ), I will instead link you up to a video with Tim demo’ing the markers for Noell Hyman over at Paperclipping.com, BUT—please wait until I finish telling you about the OTHER AMAZING MARKERS I fell in love with at CHA directly below this video!! The Copics are designed for use by professional illustrators (which I am certainly NOT!). The Spectrum Noir markers are designed for use by paper crafters (which I most certainly am!!!). I found the blending to be much easier for me with the Spectrum Noir markers (going forward I’ll abbreviate these as SN!!) than what I usually go through with my Copics. The best way I can describe it is that an image that I colored in the class with the SN Markers took me about 10 minutes or so to complete, and when I got home, I copied that same image, then colored it with my Copics and that same image took me about 25+ minutes to complete using my Copics. I really like that the SN Markers are available in twelve sets of 6 makers each. And these 12 sets make up the main “body” of the Spectrum Noir family. However, for those who want even more options, they can then add the other four 24-piece sets. And there is NO duplication within any of these sets, so in other words, if you own all twelve of the 6-piece sets and then you add the other four 24-piece sets, there will be NO duplication at all. I’ve decided that because I like these Spectrum Noir Markers so much for those of us who are just regular, everyday paper-crafters, that not only am I going to sell them, but I am also going to take the extra steps required to become certified to teach them, so I hope that will be helpful to all of you going forward and that I can become a resource in yet another area for you. Each 6-piece set has a retail price/MSRP of $11.99, but my price fore each set is only $8.95. And if you purchase all twelve of the sets together, I will discount it even further and the total price for all twelve sets will be $99.95. The additional four 24-piece sets have a retail price/MSRP of $49.99, but my price for each of those sets is only $37.50. And again, if you want to purchase all four of the 24-piece sets at the same time, I will discount it even more to a total of $143.80 for all four 24-piece sets. Two separate shipments: If you want to get your hands on the initial twelve 6-piece sets ASAP, then you can elect to have them shipped out to you ASAP, just as soon as they arrive here (FYI-- I’m expecting them sometime during the week of Feb.13th-17th) in shipment #1. Then, when the additional four 24-piece sets arrive here from the manufacturer in late March, I will ship those four sets to you in shipment #2. One shipment: If you’re willing to wait until all the markers arrive here, (which is estimated by the manufacturer to be in late March for those additional four 24-piece sets), then I will ship them all to you (the shipment would include the initial twelve 6-piece sets, and the additional four 24-piece sets) in one shipment in late March. OK, I think that’s enough for today, LOL!!! I will continue on about more cool and amazing stuff from CHA in the next segments!! I thought I’d better get back to blogging and finish telling all of you about my CHA highlights, after needing a few days to recover from being on my feet for 4 days!! Let’s start with Provo Craft – Cricut, Cuttlebug & more: Here’s what new & fabulous: Can I get a Halleluiah?? FINALLY—they are releasing a new version of the Tags, Bags, Boxes and More 2 Cricut cartridge (TBBM2), which IMHO is a “have-to-have” cartridge for every Cricut user! They’ve done some very smart things with this updated version, including having the optional ability to have some of the boxes cut out in 2 pieces (that you can then tape together), which means you can make much larger versions of those boxes than if you could only cut it them in one full piece!!! WOOHOOOOOOOOO!!! But hold on Cricuteers, there’s more!! They are also releasing a SCORING BLADE that will work with this cartridge and selected others in the future!! In other words, many of the images on this new TBBM2 cartridge have score lines built into the designs, so at some point when you’re cutting, the machine will allow you to insert your scoring blade, then it will go through and add all the score lines that have been pre-designed into these particular images. So when you’re done and pull your cut images off the Cricut cutting mat, they will already have the score lines all done for you---and please note that we are talking about actual score LINES and NOT those little tic marks that had been designed into images on previous cartridges (and that soooo many of us really don’t love!)!! HOWEVER, this is for cartridges going forward, it is not backwards compatible because none of the previous cartridges have had the score lines built into them. (But wouldn’t that be an AMAZING update to the Cricut Craft Room Design program?? Are you listening Provo Craft??? Could you please go into all the images on previous cartridges that have those “tic lines” built into them and through using Cricut Craft Room only, give us an option to change those tic marks to score lines instead??? THAT WOULD BE AN AMAZING THING TO DO FOR US!!!! If you agree with me, please make sure you add a comment!!! Next update for the Cricut is that they finally came up with their own Cricut Gel Pens and Gel Pen Holder. I saw several examples at CHA where they had used the most DARLING “hand-writing” font off the new TBBM2 cartridge with the gel pens and added the sentiment INSIDE of greeting cards (so it actually looked hand-written!! ), or another great use would be for journaling!!! I am soooo in love with this particular font from TBBM2, I know I’ll be using it all the time (especially because ,my hand writing is pretty pitiful, LOL!!!)! Next up is Cuttlebug: First, Provo Craft has recognized that their embossing folders have had an issue in that the design doesn’t extend all the way to the edges of the folder, so we haven’t been getting a full imprint. Well, they are changing that, so on their new designs going forward, the design will extend to the edges of the folder. So no longer will you have to try to figure out exactly how to position the paper up against the line(s) where the design starts and stops. THANK YOU Provo Craft!! Next, Josh from Provo Craft assured me that going forward, when they release new 5x7” Cuttlebug folders, they will also include a matching border embossing folder with it!!! I LOVE THAT!!! WOOHOO AGAIN!!!!!! FYI, because I have sooooo much to tell you about, I’m going to segment my blog posts into either by Manufacturer, or by similar products. So please be sure to check out all my blog posts about CHA! !